© 1973, 1996 Sony Music Entertainment Inc. 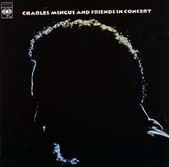 There I stood on the stage, overjoyed because I, as an appreciative listener, was able to give Charles Mingus something - and that is my voice or my presence as Bill Cosby the comedian introducing Charles Mingus. All compositions by Charles Mingus unless otherwise noted; * arranged by Sy Johnson, ** arranged by Charles Mingus, Teo Macero and Sy Johnson, *** arranged by Charles Mingus. Some discographies list Avery Fisher Hall as the location instead of Philharmonic Hall at Lincoln Center.